Indian economy and its "crony capitalism risk"
Business Standard reports that the Supreme Court's recent decision to cancel 194 coal block allocations made since 1993, coming on the back of the cancellation of 3G telecom spectrum licenses, "reminds all investors that India is a country fraught with political risk". A more appropriate characterization of the risk would be "crony capitalism risk". As the Indian economy liberalized in the nineties, the old license permit raj, which was underpinned by an unhealthy relationship between businesses, officials, and politicians, contrary to popular perception, got strengthened rather than weakened. A far more entrenched, pervasive, and corrosive nexus emerged as economic growth surged and private participation in many sectors expanded dramatically. Several forces were at play in accentuating this trend. On the one side, the rising tide of private participation led to the opening of several sectors and hugely valuable public resources - land, coastline, minerals, water, spectrum, airline routes, public sector bank credit, etc - were allotted to corporate groups. The commercial stakes associated with these transactions were on a qualitatively different scale compared to anything done before. Apart from resource allocations, private participation increased in several other areas - project and facilities management, operation and maintenance, quality control, routine services, and so on - often directly substituting public personnel. On the other, these allocations and contracting were, most often, not only done in an ad-hoc manner without a transparent, competitive, and fair policy framework, but also by system which did not have the institutional capacity to effectively design and manage these contracts. One-sided contracts which very adversely affected public interest passed through the gates of ill-equipped and compromised gate-keepers with minimal due diligence. Corporate greed, the exploding cost of electoral politics and campaign finance, and incentives within the bureaucracy aggressively fueled these forces. India's version of crony capitalism had taken stage. History teaches us that this phase has been a feature of economic development and structural transformations across the world. The "robber barons" of the gilded age in the United States had their counterparts in East Asian "crony capitalists". The only difference from these experiences may be that our version has had egregious excesses involving massive amounts of public losses, over a very short time, and in an environment where judicial and media activism are at their peaks. In the late nineties and most of last decade, the massive profit opportunities in opaque and customized resource allocations and public contracts helped corporates, Indian and foreign, enjoy a very high "crony capitalism premium". Then as the tide turned and the backlash started, the premium has been replaced by a steep discount. This should not come as a big surprise. Common sense tells us that there are no free lunches - disproportionate returns are always accompanied by high risks. It is a tribute to the country's democratic institutions and checks and balances that these excesses are being corrected. It is certain that this cleansing would result in the emergence of a more healthy and stable politico-economic business environment in the country. What is not certain though is how much more cancellations and uncertainty will have to pass before that environment emerges. It is likely that more of such cancellations will happen in the months ahead. Which of oil blocks, airlines routes, space spectrum, and land is coming next? A recent KPMG-CII report on India's business environment examined, among other areas, the impact of labor market regulations. 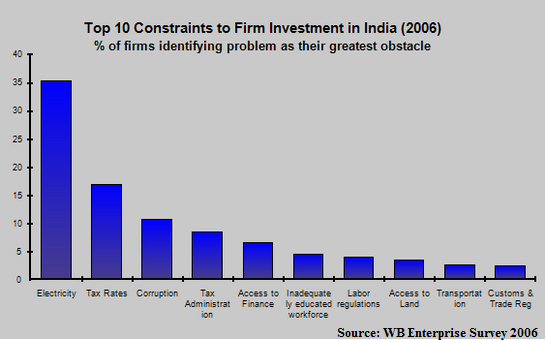 It finds that labor related approvals are not among the biggest obstacles, as cited by businesses, for starting a business. Similarly, for running businesses, respondents claimed that skill gap and recruitment problems were a much bigger obstacle than the cost and time required to comply with labor regulations. Finally, the regulation of employment - in terms of hiring and redundancy of workers and rigidity of working hours - as captured in the Doing Business Survey finds that India's employee redundancy dismissal requirements are far less onerous than most of its emerging market competitors.